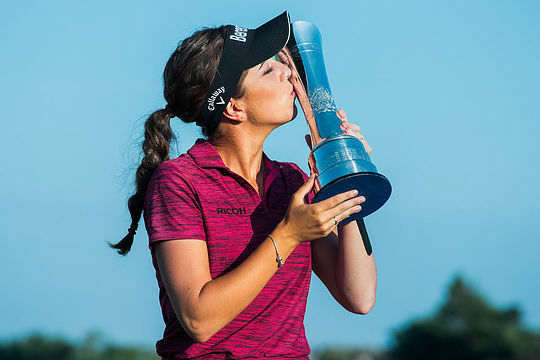 Young English golfer Georgia Hall joined some illustrious company when she prevailed over golf’s biggest names to win the 2018 Women’s British Open at Royal Lytham and St Annes last weekend. It was Hall’s first major as she joined Karen Stupples (2004) as the only English player to win the Open since it was elevated to major status in 2001. Scotland’s Catriona Matthew also won this major in 2009. Hall, 22, was incredibly solid throughout the week, dropping just three shots to par in four rounds as she reeled off rounds of 67-68-69-67 to win by two shots from plucky Thai player Pornanong Phatlum with South Korean So Yeon Ryu a further two shots back in third place. Certainly Hall had the home crowd well and truly on her side and as she approached the final green with an unassailable lead with the crowd applauding enthusiastically. The day began with Phatlum at 13-under par and Hall one back, but everyone had their eyes on the penultimate group of Ryu and Sung Hyun Park, who were at 11-under and 10-under respectively. Both were double major winners, but both played their way out of it early, Ryu with a triple bogey on No. 3 and Park by playing Nos. 4 through 7 six-over par, and it became clear that the championship was going to be decided in the final twosome. “I always joked that a major would be my first win,” grinned Hall. Hall averaged just 28 putts per round and was seven-for-seven in sand saves on a Lytham layout somewhat famous for its strategic bunkering. Minjee Lee finished the best of the Australians in outright 10th place with Su Oh another two shots back in a tie for 15th. Hannah Green and Rebecca Artis were 55th and 61st respectively.